A re-enactment of the Battle of Hastings on what is believed to be the original 1066 battlefield has been cancelled for a second year running. It is eight months until the event was to be staged, near the anniversary of the battle in October, but English Heritage has said weather damage to the field already means it cannot go ahead. The second day of last year's event was called off because of torrential rain. English Heritage said it is the biggest event it stages in the South East. 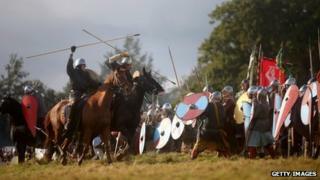 The 2013 re-enactment of the Battle of Hastings was to have been held on the weekend of 12 and 13 October. The annual event marks the anniversary of the battle on 14 October 1066. The victory of William, Duke of Normandy, over King Harold changed English history. Since English Heritage began running the event in 1985, up to 1,000 re-enactors have taken part in the battle, in the shadow of Battle Abbey in East Sussex. English Heritage said that despite laying tracking on the ground, wet weather had taken its toll. Its experts say the area needs to be re-seeded and rested to enable it to fully recover and establish a more robust grass surface. "We know we are disappointing people this year but hopefully we can kick start the events programme again next year," said property manager Joanne Stewart. "We definitely will be having future battles on the site. "We have to remember that underneath that battlefield is archaeology - not necessarily from the 1066 Battle of Hastings, but from that era up to the present day. "There's World War II archaeology under there and the actual shape of the landscape, which was shaped by the battle and the subsequent building of the abbey. "We want to maintain that for future generations after we have gone." The battlefield will also be out of action for the town's annual bonfire celebrations, usually held on the site. Alan Deeprose, landlord of The Bull Inn on Battle High Street, said cancelling the re-enactment would damage local businesses. "It is not great news for the town as a whole," he said. "It is a town that really evolved around the abbey - ever since 1066 it is a town that used the abbey as a form of income. "The bonfire and the re-enactment are big weekends - they make the economy of the town."